Right Now: I’ve banked some blog posts and preset them to self-publish. I want to 1) focus on hosting my U.S. visitors in site and 2) leave my laptop when we go south to Manú Reserva for Thanksgiving. Back to real-time weekly posts come December! In the meantime, here’s some good old-fashioned PC Goal Three about PC Goal Two. 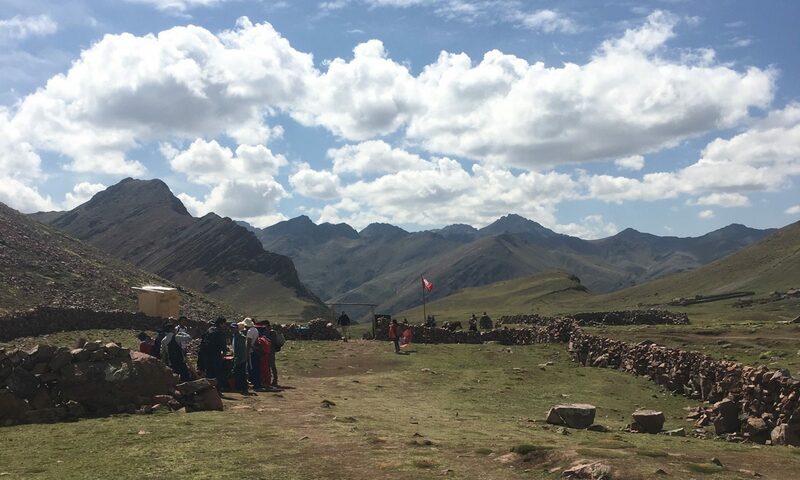 Peace Corps has three goals to promote world peace and friendship: 1) Share skills and stuff 2) Share U.S. culture with your host country 3) Learn and share [Peruvian] culture with people back home. Site Mate B is game for most of my impulsive ideas. Additionally, B moved into her own apartment (swoon) in June for a variety of reasons (and all of them are not why I am swooning.) I just like the idea she can sleep in and not get family-summoned at any time of day. That part is swoon-worthy. She can also have a sick day outside the fishbowl. That’s both good and bad. As one of our many Peace Corps rules, PCV’s in Peru must live with their assigned host family for the first six months of service. After that we are allowed to apply to move to independent living. We are highly encouraged to remain living with our host families for the duration of service, mostly for security reasons, and according to the stats, most do. She has no idea but I only text B every 24 hours to make sure she hasn’t died or permanently gone pirata. Today’s text rouse implied I thought it would be fun to have an American over for lunch and hijack la cocina. I checked in with my host-sister Jenny, as the kitchen is her domain, and we danced the Peruvian courtesy dance of “If you want?” and my response “If you want?” and then I grabbed la canasta (a sturdy shopping basket that makes me feel powerful and local) and out the door we went. Galvan is like a mini-to-average small town supermarket in the States. It has five aisles, sometimes two sections deep. The market open over Christmas in West Yellowstone, Montana is bigger than our market in Oxapampa. They do have some bonus extranjera items (I remember when this phenomenon happened in Lander, Wyoming, for the NOLS backpackers) such as tortillas (like Mexican flour tortillas in a bag – in Peru a tortilla is like a lazy omelette), coconut milk in cans, and curry in a non-roman language alphabet. Back home in Wyoming with the weather change I generally make thai chicken coconut curry soup in my hostile and hazardous crockpot. Decision made: Today we would make Peruvian American Thai Coconut Asian Curry Soup… and American-Mexican fajitas. Because, hashtag, Goal Two. I wave off the bolsas (everything now comes in plastic bags packed in plastic bags) to draw reminding attention to the fact I am a LOCAL and not a TOURIST because I have a BASKET. Then we go to B’s “Chicken Guy” and she orders two pechos. This is chicken breast, but they come in twos, still attached to the breast plate. I was not ready to throw a fully intact chicken in there like a real local. Then I went to the lady that’s happy to see me (mi casera) and purchased red bell peppers, onions, carrots, apio (celery) and spinach. Onions, garlic, and potatoes were in stock at home. Many other things happen en route to las compras and many things happen en route to home. That’s part of the joy of having a day off to wander the market and daydream about how you’re hijacking a Peruvian’s kitchen. B went home to make double chocolate cookies and I started panicking about how to make chicken broth without boiling bones for three days. Turns out, you can blanch the pechos in boiling water and call it caldo (broth) enough. My mother’s ghost voice screamed SALMONELLA in my ear for a good while. That was fun. Pauly and Briauna said I was all set to not poison all of us. So. Hey NOLSies – Can you name this spice? Multiple mystery NOLS powders were wielded in the alchemy of our not-at-all American Goal Two Lunch. The curry soup was amazing, and my favorite part was watching Briauna teach my family how to make and eat a fajita. Comments about “isn’t this really what you people call a taco” were floating around and Jenny said “no this is a sandal” (because taco in Peru means a pair of heeled shoes) and everyone laughed and I got to explain the joke to Briauna. In addition to feeling good about my family, and welcoming someone to the table, I got to yell at everyone to “COME COME COME!” (“co-may co-may co-may” or EAT EAT EAT) like a pushy Italian grandmother serving Peruvian American Thai and Mexican food to her brood. Maybe, just for today, I am starting to fit in my tacos around here. Please get back to me on a good approach to bringing up the subject “sinus clearing” in my 5-year-old kid level Spanish. I heart you. I got to feel nourished from food from “home” and share it with my family. Thank you, thank you, thank you. Hugs. Wishing I was there to eat some of your Asian Mexican American food ♥️ Enjoy your visitors! Damn. You’ve got GIFs now in your posts. Mastering the blog game! Jajajajaja T.W. thanks! Did you change your device or get better than horrible internet so you can see? They were always there ? I never saw them before. I think I started giffing when I got in-site. It begins with a storm trooper flash mob, naturally. Thanks for being my blog-friend. Heard you had a great time taking Ivy’s EEUU friend for a climb! Likewise. Its important to compensate lonliness with virtual friendships. And yeah, we had a blast that day. Lots of climbing!